UFC 17.5: Ultimate Brazil was the UFC's first trip to Brazil and featured Frank Shamrock vs. John Lober, Pat Miletich vs. Mikey Burnett, Vitor Belfort vs. Wanderlei Silva, Pedro Rizzo vs. 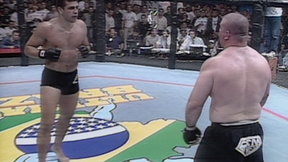 Tank Abbott, Tsuyoshi Kosaka vs. Pete Williams, and Ebenezer Fontes Braga vs. Jeremy Horn. Frank Shamrock vs. John Lober Ultimate Brazil Fri, Oct 16, 1998 (18:20) In the main event, UFC middleweight champion Frank Shamrock, who was enjoying a six fight win streak and aiming to successfully defend his belt for the third time, tangled with John “Machine” Lober, who held a split-decision win over Shamrock. Pat Miletich vs. Mikey Burnett Ultimate Brazil Fri, Oct 16, 1998 (33:21) To crown the first UFC lightweight (later renamed welterweight) champion, “The Croatian Sensation” Pat Miletich with his impeccable 20-1-2 record entered the Octagon against the 4-1, Lion’s Den product Mikey Burnett. Pedro Rizzo vs. Tank Abbott Ultimate Brazil Fri, Oct 16, 1998 (14:30) In a Octagon classic for the ages, two concrete chucking heavyweights squared off to the absolute roars of those in attendance as UFC veteran David “Tank” Abbott met his heavy-handed Brazilian counterpart in the debuting Pedro “The Rock” Rizzo. Tsuyoshi Kohsaka vs. Pete Williams Ultimate Brazil Fri, Oct 16, 1998 (24:55) Both of these heavyweights were riding extra high on confidence entering this bout as Japanese MMA fighter Tsuyoshi Kosaka was enjoying a 3 fight win streak while the Lion’s Den’s Pete Williams had just scored the knockout of his life over Mark Coleman. 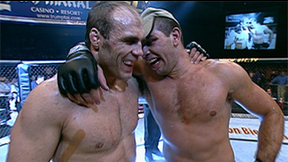 Ebenezer Braga vs. Jeremy Horn Ultimate Brazil Fri, Oct 16, 1998 (11:33) In a showdown between experienced MMA fighters, Gracie Barra product Ebenezer Fontes Braga with a pro record of 9-3 made his Octagon debut against grappling ace Jeremy Horn with a 13-3-3 record who was making his second UFC appearance.